The publication goes on to name the “finest European grapes [grown in the Grand Valley], such the Black Hamburg, Flame Tokay, Zinfandel, Sultana, Muscat and Malaga,” a list that would have impressed a nineteenth- century sommelier. to 1,037,614 pounds, with 1,034 farms involved in grape production statewide. Many of the European settlers who had come to Colorado to work the mines in areas like Pueblo and Cañon City brought viticulture and a winemaking tradition with them. Unfortunately, Colorado was ahead of the times and adopted Prohibition in 1916, four years before the rest of the nation. Grand Junction historian Abbot Fey calls Prohibition the advent of the peach industry in the Grand Valley as hundreds of thousands of grape vines were torn out when the wine tap was closed by the government. In 1968, Denver dentist Dr. Gerald Ivancie founded the first modern winery in Colorado in his cellar. He hired an aspiring winemaker, Warren Winiarski, who went on to make wine at Stag’s Leap Wine Cellars and had some notable success at the Judgment of Paris in 1976. At Ivancie’s urging and Winiarski’s recom- mendation, grapes were reintroduced to the Grand Valley in the early 1970s. Colorado State University participated in viticultural research as part of a federally funded Four Corners Project grant that looked at the viability of grapes as an agricultural economic generator in all four of the adjacent states. That project would be the genesis for the current industry in all four states. Jim and Ann Seewald headed a group of 18 investors to found Colorado Mountain Vineyards, and in 1978, the Denver winery produced its first bottle from Colorado grapes. After many corporate reorganizations, Colorado Mountain Vineyards essentially operates today as Colorado Cellars in Palisade. The idea of using Colorado grapes grew quickly. Theron Barber planted mostly hybrid grapes across the interstate from the World Arena in Colorado Springs in 1979 as vitis vinifera, the species of the classic European wine grape varieties, does not tolerate the extreme temperatures and fluctuations of the Front Range. His winery, Pikes Peak Vineyards, had its first crush in 1984. Hobby winemakers Doug Phillips and Eric Bruner founded Plum Creek Cellars in 1985 along its namesake in Larkspur, but soon moved the operation to Palisade to be near the grapes they had planted. Grape grower Steve Smith opened Grande River Vineyards in 1987, and Parker and Mary Carlson followed suit with Carlson Vineyards and Winery in 1988. 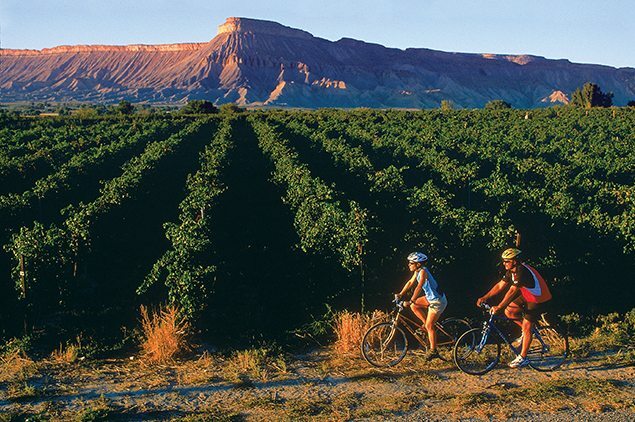 Due to its agricultural roots and its potential to stimulate the economy of many parts of the Western Slope, the Colorado wine industry has always enjoyed the avid support of the state legislature. The Colorado Lim- ited Winery Act, passed in 1977, gave small wineries using primarily Colorado fruit and produce to make their wine a reduced cost license that allowed self-distribution, without needing to go through a licensed wholesaler. It also allowed up to five remote sales and tasting rooms, plus one on the manufacturing prem- ises, from which to sell Colorado wine directly to consumers. Photo courtesy of Colorado Wine Industry Development Board. These privileges, plus the Colorado Wine Festival License, enacted by the state legislature in 1999, permitted manufacturers of vinous spirits in the state unprecedented access for sell- ing their products directly to consumers. While limited wineries were always allowed direct-to- consumer shipping, the legislature brought that privilege into compliance with the Granholm Decision (U.S. Supreme Court, 2005) in the 2006 session. More recently, the legislature first allowed wineries, then breweries, to take advan- tage of a federal rule allowing manufacturers of wine or beer to share “alternating premises” for production activities, thereby reducing the initial capital investment required to get into the business. Perhaps the single event that moved Colorado’s wine industry further ahead of the other Four Corner states was the passage of the Colorado Wine Industry Development Act in 1990 by the state legislature. Modeled after Missouri and Oregon’s wine promotion statutes, the act created a continuously appropriated funding stream from a penny per liter excise tax on all wine sold in the state, an additional $0.01-$0.05 per liter sliding scale excise tax on wine produced by Colorado wineries, and $10 per ton on grapes and other produce used by Colorado wineries to make wine.